AUDITIONS for the children’s musical “A PIRATE’S LIFE FOR ME!” by Craig Sodaro, with music & lyrics by Bill Francoeur, on April 13th at 1:00pm and April 14th at 6:00pm at the Playhouse. AUDITIONS open to all ages, 8 years and up. Please prepare a short song to sing A Cappella. You will be asked to participate in some movement and dance moves. To entertain, enrich, and educate through community involvement in live theater. To be recognized as a premier provider of quality entertainment and culture through live performing art. Auditions for Wind in the Willows will take place tomorrow (Sunday, Feb 3rd) at 6pm. Auditions are open to everyone and all ages are encouraged to come. Even if you have never been on stage before. We want you. So please, come out and have some fun with us while we put together this wonderful musical. Auditions will consist of song, dance and a cold reading from the script. 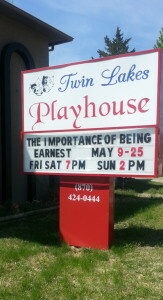 Do you want to know what is going on at Twin Lakes Playhouse or do you want to get involved in some way? Please feel free to join us at our Monthly Members Meeting, every 3rd Monday of the month at 7:00 p.m.
We are at the corner of 6th and Hall St.